CBS News is reporting on an incident from June 30th in Glencoe when Evanston pastor, Rev. Michael James was ticketed for bicycling through a construction zone. According to the report, Rev. James does not dispute the fact that he rode through the construction zone. Rev. James' objection, rather, is that he was the lone bicyclist ticketed while other bicyclists rode past. The situation is disturbing in that while Rev. James is black, the other riders who he claims rode through without being ticketed were all white. According to Rev. James the Glencoe police officer claimed she didn't see these other bicyclists. Rev. James, who was obviously at the scene, claims that it was impossible for the Glencoe police officer to not see the other bicyclists. All Illinois bicyclists have the same rights and responsibilities as motorists on the roadway. 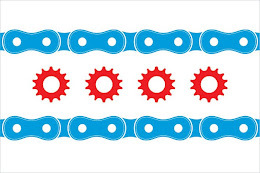 The universality of this law is in place not to penalize bicyclists, but rather to make bicycle riding safer and ultimately reduce the number of bicycle accidents in Illinois. This means that any construction zone when a motorist shouldn't drive, a bicyclist shouldn't ride. If a bicyclist rides through a construction zone they are at much risk for a ticket as a motorist. This is a reasonable and fair application of Illinois law. But if what Rev. James is saying is true, the way he was treated was totally unreasonable and unfair. What should have happened is that ALL of the bicyclists should have been ticketed or ALL of the bicyclists should have been given a warning about interfering with a construction zone. No single bicyclist should have been singled out for any reason. The Green Bay Trail runs through Glencoe and is a route taken by many bicyclists from a lot of different areas and a lot of different backgrounds. The idea that a bicyclist would be profiled based on race in the year 2012 in a major metropolitan area is disturbing. If nothing else, hopefully this story is a reminder that we all need to be accepting and respectful of each other in any situation.